When and why should I create a project? If I don't create a project for a study area, where will my analysis results be stored? Is it easy to share my projects? I accidentally deleted a saved map document. Can I retrieve the projects that it contained? Can I see my projects in ArcCatalog? Why are my projects displayed in ArcCatalog? Do I have to create a project? Can I access data for more than one project at a time in a single map document? What happens to the My Output Data folder when I install Business Analyst? Projects are a way of organizing your work in Business Analyst, making it easier to manage, back up, and share analysis results. As part of the Business Analyst Study Area wizard, you can create a new project for this study area. It is located on the same panel of the wizard where you name your study area. By default, the option to create a new project for the given study area is not selected. You can also create and manage your projects using the Active Project command on the Business Analyst drop-down menu. If you want to use projects to organize your work, create projects using the Study Area wizard. Additionally, projects can also be created by clicking Active Project, then clicking Create Project. The Project Explorer window adds extra functionality to group projects outside the ArcGIS table of contents where you can export, copy, move, and back up multiple projects. You should create projects when you want to save your work and need to retrieve data easily and quickly or to share your project with another Business Analyst user. Projects are used as an organizational tool in the same way as map documents, except projects determine where your analysis results are saved. If you use projects, all layers and analyses created while a project is active (store layers, customer layers, study areas, trade areas, analyses, reports, and so on) will be stored in a folder with the project name on your hard drive in the My Output Data folder. Your analysis will be stored, along with all your projects, in your My Output Data folder. There is a default project. Your work will be saved here if it is not saved in a project. On the Business Analyst drop-down menu, the Active Project command allows you to choose the active project. There will be a default project even if there are no projects created. Business Analyst keeps track of the last active project. If a saved .mxd is opened that was previously used with another active project, you will need to change the active project if you want to return to the old project. You can manage your project by clicking Active Project on the Business Analyst drop-down menu and clicking Manage Projects. You can activate, delete, or rename a project and edit comments. You can use the Project Explorer to manage all projects without accessing the standard ArcGIS table of contents. This is helpful when working with multiple projects or transferring layers from one project to the next. Yes, each project folder in the My Output Data folder contains everything that was created in Business Analyst for that respective project. If you receive a project folder from a fellow user, place it in your My Output Data folder. Launch Business Analyst; activate that project; and begin loading any analyses, study areas, customer/store layers, trade areas, and so on, by clicking the Manage option (for example, Manage Existing Analyses) on any wizard. You can also share your projects using the context-sensitive menus in ArcCatalog. To do so, right-click the project you want to share, click Export/Backup Project, then save to a location. This will create a .zip file of all associated layers within the project. The zipped file can be shared with other users with Business Analyst. Open ArcCatalog, right-click Business Analyst Data, then click Import Project. Navigate to the zipped project you want to load. Yes, open the Business Analyst .mxd, click Active Projects from the Business Analyst drop-down menu, then click the project that was being used in the previously deleted .mxd. You can load all the data created by Business Analyst by clicking Manage on each respective wizard. Yes, you can also manage projects in ArcCatalog, which uses a catalog tree so it looks and functions similarly to Windows Explorer. Your project can be managed in a number of ways including moving/copying/deleting/viewing it in its entirety or only specific layers within it. For example, a drive-time polygon can be copied from one project to another. Because Business Analyst projects are in ArcCatalog, it is easy to use the Business Analyst data layers (customers, stores, trade areas, and so on) in ArcToolbox. For example, if you've created a store layer in a project, you can drag it into the Drive Time tool in ArcToolbox. It can also be dragged from ArcCatalog onto a map. No, navigate to Active Project where you'll see <default project>. You can store anything not needing a specific project here. Yes, changing the active project allows you to add data from that project. The data remains in your table of contents even if you switch to a different project. Any new layers created are placed in the currently active project. When working in ArcMap, you can click Update Map in the Project Explorer to add all layers for each project to the table of the contents. 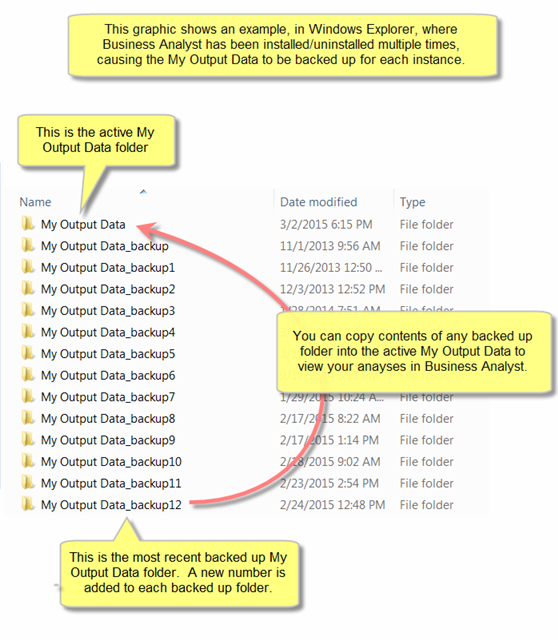 The installation of Business Analyst creates a backup of the My Output Data folder. Each time you run a new installation or an annual data update or rerun an existing installation, a My Output Data_backup folder is created. For example, if you reinstall three times, you will see My Output Data_backup, My Output Data_backup1, and My Output Data_backup2. Your new analyses will be saved to the newly created My Output Data folder. You can also copy any of the backed-up files into your My Output Data folder. Individual Analyses: Use this option if you only want to view individual analyses, such as trade areas, but do not want to associate them with a project you have created. Copy your individual trade area folders from My Output Data_backup to My Output Data\Projects\Default Project\TradeAreas. Projects: Use this option if you want to view whole projects that you have created. Copy your project folders from My Output Data_backup to My Output Data\Projects\. You can also use the Import Project wizard accessed through the Project Explorer or ArcCatalog to import an entire project and maintain its structure. Entire My Output Data directory: Use this option if you want to use your entire My Output Data folder from a previous installation. Delete the newly created My Output Data folder. Rename your My Output Data_backup folder as My Output Data.